Which makes of camcorders do you repair? We repair Sony, Panasonic, Canon and JVC Camcorders. 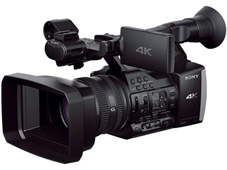 We specialise in repair of Sony and Panasonic Professional camcorders. Do you repair professional camcorders? Yes we do. We repair Sony, Panasonic and Canon professional camcorders. Do you repair still cameras? Yes we do repair the high end of still cameras of Sony, Panasonic & Canon. If you are unsure, please call us on 020 8950 9911 to confirm. What are your charges to fix the camcorder? Do you charge for diagnostic estimate? No we do not charge for estimates. However, If you require estimates for insurance claim, then we charge. What is your turnaround time?? Generally our turnaround is 2-5 working days. If for some reason there is a delay in parts availability, then we will keep you posted. What is your Guarantee on repair? We provide six months guarantee on replaced parts and labour. Do you charge for return carriage? All repairs completed by us which are domestic models are eligible for free return carriage. All unrepaired items will incur return carriage charge. All professional camcorders will incur return carriage charge. What should I send with my camcorder? We only require your camcorder. We do not require any accessories like power adaptors, battery, leads etc unless you think they are related to the fault. What is the best way to send my camcorder? If you have any existing preferred couriers, then that is fine otherwise Royal Mail Special Delivery is the best because it automatically covers for £500.00 insurance. Why should I choose Digi Service for my camcorder repair? We are a long established company and we are proud of our reputation for professionalism. Our technicians are highly trained certified engineers. As they only repair camcorders, their product knowledge and experience are unrivalled. Our Testimonials say it all. Copyright © 2015 Digiservice.Co.Uk | All Rights Reserved.